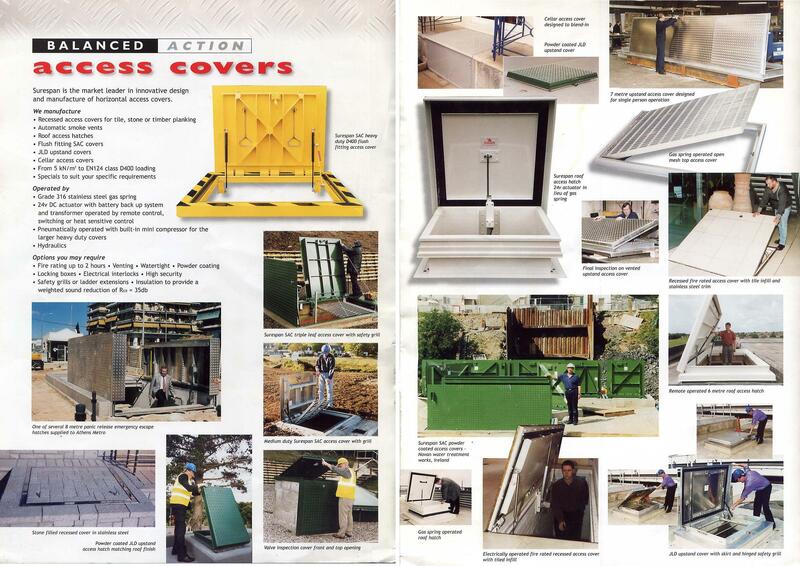 Surespan is the market leader in the innovative design and manufacture of roof hatches, floor access covers and ladders, which can all be built to order. We pride ourselves on offering clients the complete 'Access Package' as we are also able to offer ceiling and wall access panels, glazed roof lights, floor ducting as well as a maintenance free roof handrailing system. Surespan provides a full range of access covers for internal and external uses, ranging from 5kN/m² to 158kN/m² live loads, which are available in standard sizes or can be custom made for the individual needs. Surespan products are made to a modern design and manufactured in a high-tech environment to close tolerances. The standard access covers are constructed with a strong aluminium extrusion frame and feature a special gas spring assisted balanced action, making the opening and closing easy - and that means smoothly, efficiently and safely. All Surespan access products are available polyester powder coated to any RAL colour.